LONG BEACH — More than 100 of the best college sailors in the country spent more time parked on flat water than racing on Day 1 of the 29th annual Rose Bowl Regatta Saturday, Jan. 4, but they didn’t complain much. Many had come to a sublime and sunny Southern California from the miserable weather conditions the rest of the country has been suffering. Georgetown University and Point Loma High School will tell you that the 29th annual Rose Bowl Regatta was an event when it paid to pick your partner. With 26 college teams from across the country and 63 high schools from California all sailing little 13-foot, 3-inch CFJ dinghies and winds varying from 2 knots to 7 or 8 knots, nobody needed extra ballast. The San Diego team—with 110-pound Rebecca McElvain crewing for Scott Sinks on the lead boat, hardly missed a beat in seizing its eighth consecutive High School Gold fleet championship. Meanwhile, on the same short trapezoid course set off the beach in front of spectators on the Belmont Veterans Memorial Pier, Georgetown’s A-boat skipper, Snow, went with 125-pound Liz Mulvaney, alternating the boat with B-boat skipper A.J. Reiter and crew Eliana Michaels. The results: finishing of logs of 2-1-3-7 and 3-6-2-3, respectively, in the 26-boat fleet. The High School Silver fleet for less expereienced sailors was won handily by Cathedral Catholic’s JV2 team from San Diego, with Ryan Ratliffe and crew Matt Parker on the A-boat and Jesse McKnight and crew Lizzy Matheson on the B-boat. All racing is off Belmont Veterans Memorial Pier east of downtown in the Long Beach outer harbor. 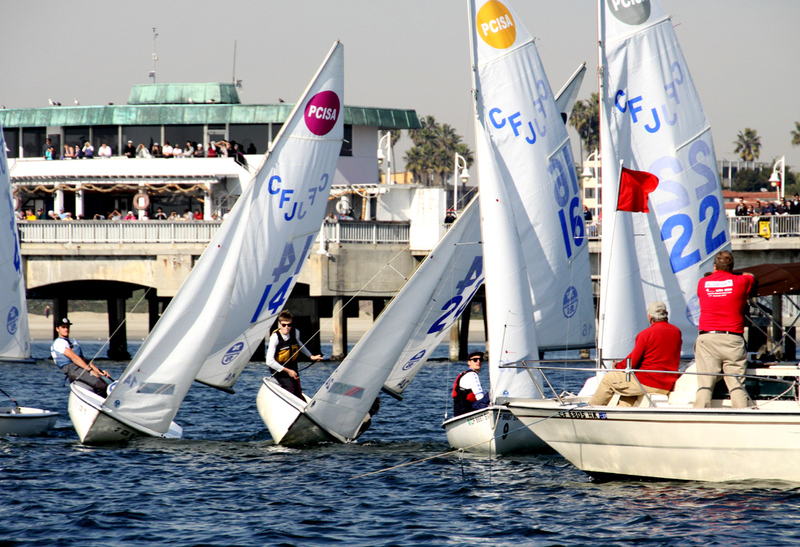 The event is hosted by the USC Sailing Team and organized by the US Sailing Center of Long Beach, which for the first time had everyone launch off the beach. 1. Cathedral Catholic JV2, 20.